Last Friday I took part in the Heads of University Centres of Biomedical Science (HUCBMS) Conference 2011 held at the Coleraine campus of the University of Ulster. I was presenting on Using Mobile Technologies and Video Sharing to Engage Students in the final session on Innovation in Teaching and Learning. This turned out to be a very interactive session and I am grateful to the delegates for the many questions and comments received during and after the presentation. My slides from the event are provided here as a PDF. 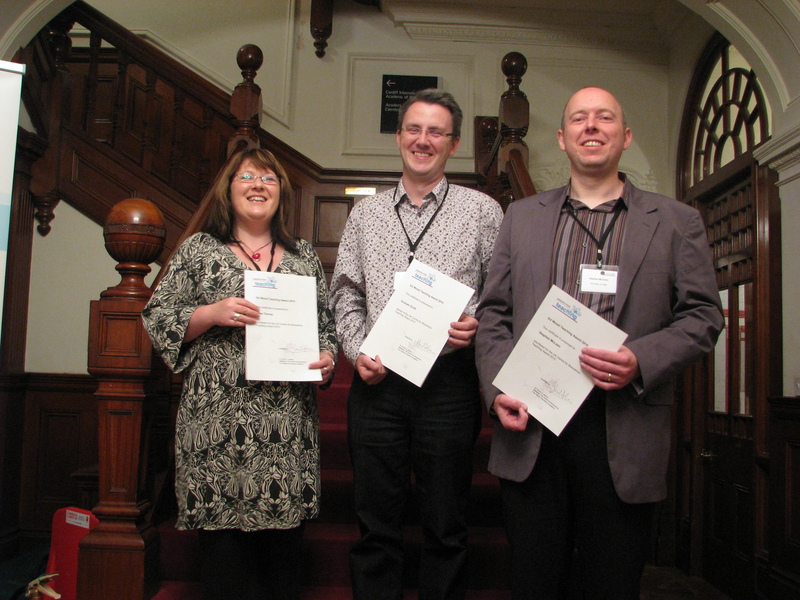 UK Centre for Bioscience Reps Forum – Awards ‘n’ All! Last week I was at the UK Centre for Bioscience Reps Forum in Cardiff and once again the meeting has provided a number of teaching ideas I hope to implement in the coming year. In this year’s forum we saw the introduction of a poster session which was the subject of one of the first activites in the meeting and provided discussion around various themes. Unfortunately due to “technical” difficulties at Cardiff airport I arrived late so did not get the full benefit of the posters. Our project on text messaging in higher education was presented at the event. The afternoon saw a showcase session for the finalists of the Ed Wood Teaching award, now rebranded as the Bioscience Teacher of the Year Award. I kicked off the session describing my case study on Using Reflective Video Sharing in Year One Chemistry Laboratory Sessions. This was followed by Graham Scott from the University of Hull, the overall winner of the award who described his study on Student managed learning: Whales, Dolphins and Sharks. Anne Tierney then described her work on The role of online diaries in creating a reflexive learning environment, bringing the session to an end. All of the case studies are on the Centre website and are linked above. I enjoyed all of these sessions but as usual was most inspired by the technology-centred sessions and found Peter Klappa’s demonstration of LightScribe most engaging. This is a method for capturing lectures where tablet technology is used; the software captures audio from the speaker as well as the text written on the tablet. A final video can then be output for hosting on a VLE. All in all another great Reps Forum; hopefully there will be many more to come…. The third science learning and teaching conference was held in Heriot Watt, Edinburgh from 16-17th June 2009. This was my first visit to this conference and I was suitably impressed. The organisation of the event by HEA staff from the Physical Science, Bioscience and Materials Science subject centres was good and the venue itself conducive to networking. Highlights for me were the opportunities for networking and meeting colleagues I had previous only encountered in silico and to experience the amplification of the conferece through twitter #sltc09. The speakers ranged from the experienced (some faces I recognised from the Variety in Chemistry Education meeting last year!) to those dipping their toes in the pedagogic conference scene for the first time. All made for a good meeting. My own feeling that pedagogy is better represented in some institutions that others was again reinforced. A quick glance at the 130 or so delegates on the list reveals a number of universities where only one representative was in attendance in contrast with the likes of the Universities of Manchester, Leicester and Limerick with their contingents of interested pedagogues. Due to personal interest I was drawn towards the “technology” related presentations though strangely in the session where I was presenting the technology failed – twice – once during my own talk! For those who missed it the slides are below.